Indeed, Japanese has a flair to make any dish seemed elaborate using the simplest ingredients. And as Singaporeans (or should we say people worldwide?) takes an earnest loving towards Japanese cuisine, we see more Japanese restaurants that serves high-quality cuisines sprouting in the city. 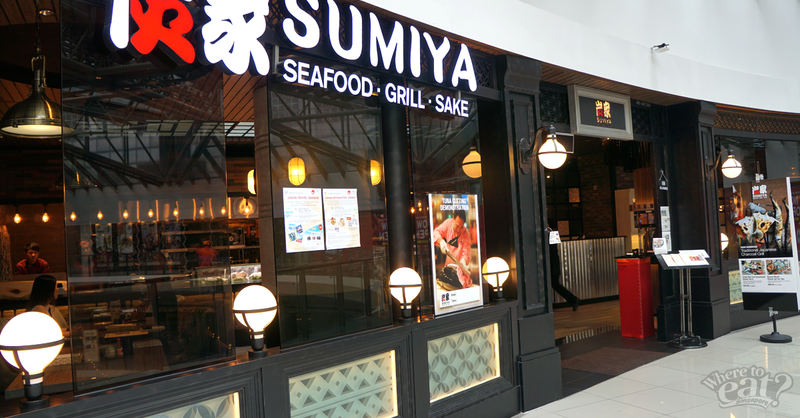 Sumiya, with its second outlet at Suntec City, is one of them where they serve traditional fare to satiate your Japanese craving. 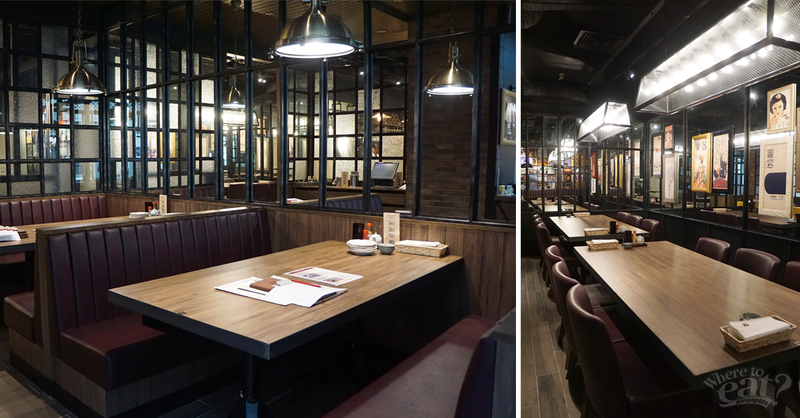 The vibe is casual yet refined, with a perfectly executed take on the classic Japanese style. Details are greatly taken care of – ranging from their careful selection of cutleries and dishwares to the exhaustive menu. The menu focuses on seafood, mostly fish, that are nothing but premium. Speaking of fish, the Bluefin tuna here is imported in halves or whole, and defleshed by Master Chef Tsuzuki Naoki. 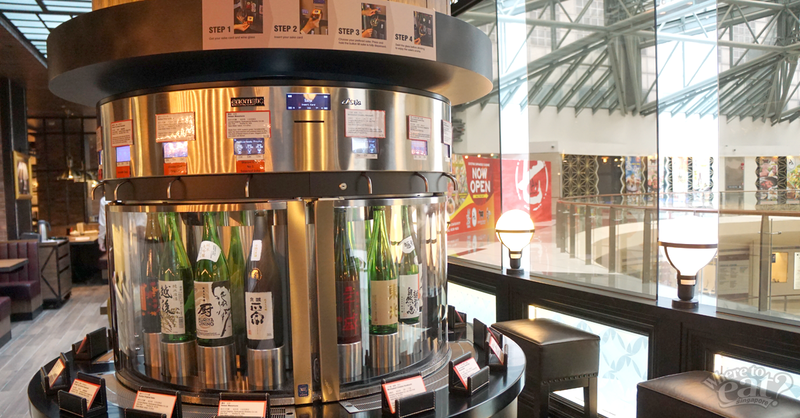 Sumiya is the first restaurant in Singapore to serve sake with an Enomatic dispenser, with 16 sake varieties to choose from. Customers can insert the sake postpaid card provided by the restaurant into the machine, select your choice of sake and portion of 20ml, 60ml or 120ml, then rest your glass under the dispenser, and enjoy your sake. From light-flavored sakes on the dispenser to premium selection of traditional shochu made from barley, sweet potatoes, and chestnuts that are available on the menu, patrons can choose accordingly to pair with their meals. And that brings us to their menu. 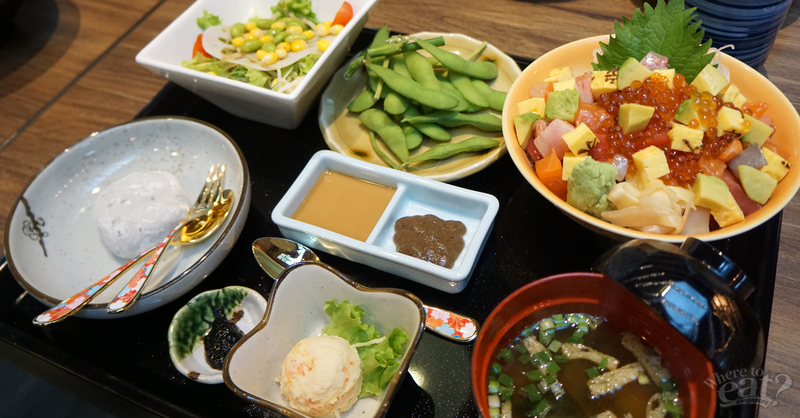 Sumiya serves surprisingly reasonable-priced lunch sets that starts from $15.80 onwards. All generously-portioned lunch sets comes with a serving of rice/sushi rice, edamame, pickles, salad, potato salad, miso soup and dessert (sesame mochi with cream filling) or fresh fruits. Limited servings of brown rice are available upon request, but there is a free refill of Japanese rice and miso soup. One of the favorites among customers, Kaisen Bara Don Set features 3 types of fish (salmon, maguro & hamachi), cubed sashimi, ikura (salmon roe), tobiko (flying fish roe) and fresh avocado, lying on a bed of fluffy vinegared sushi rice. 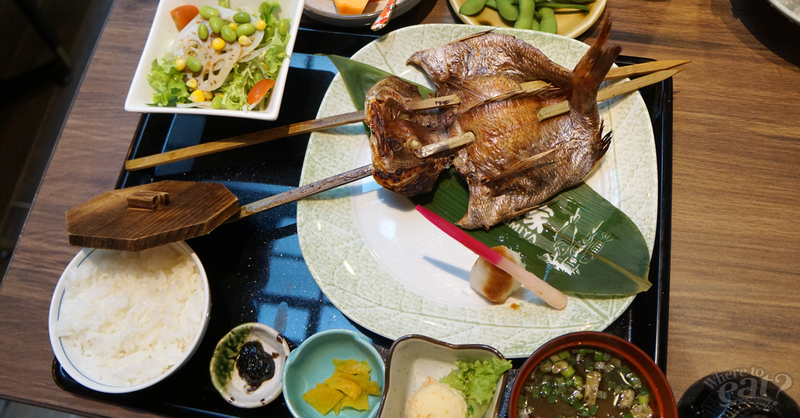 This dish is served with a special sesame sauce to pour over the don, a chef-made seasoned laver sauce, and a dipping truffle sauce which adds a dash of Western influence to the otherwise traditional Japanese dish. Limited sets of Kaisen Bara Don Set is served daily, and for those who eats only salmon, be glad to know that salmon don is available upon request. 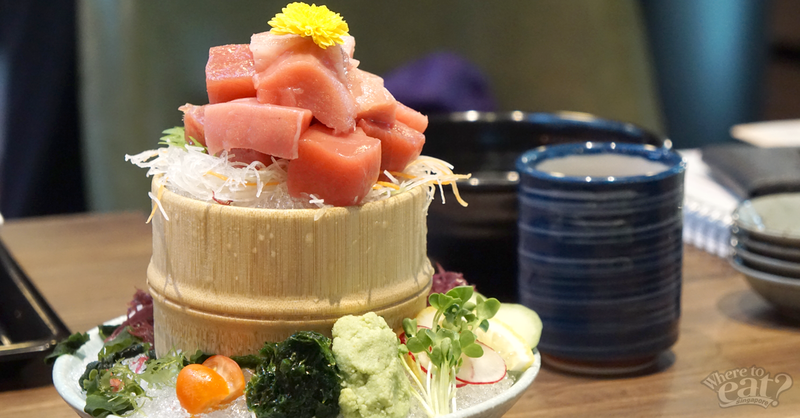 We supposed the premium Bluefin Tuna that Sumiya brings in from Japan goes mostly to this dish – Fresh Bluefin Tuna Mixed Cube Sashimi – which is an excellent choice if all you want to taste is the fresh and firm flesh. Made up of chunky cubes of fatty tuna belly (Toro), middle-fat tuna (Chutoro) and lean cut tuna (Akami) sashimi, this is bound to finish fast between 3 -4 people. Today’s Homemade Dried Fish Irori Genshiyaki Set B is basically grilling a skewered fish set vertically next to burning coals. The reason behind this method is to distance the fish from the heat and cook the fish with more uniformity. 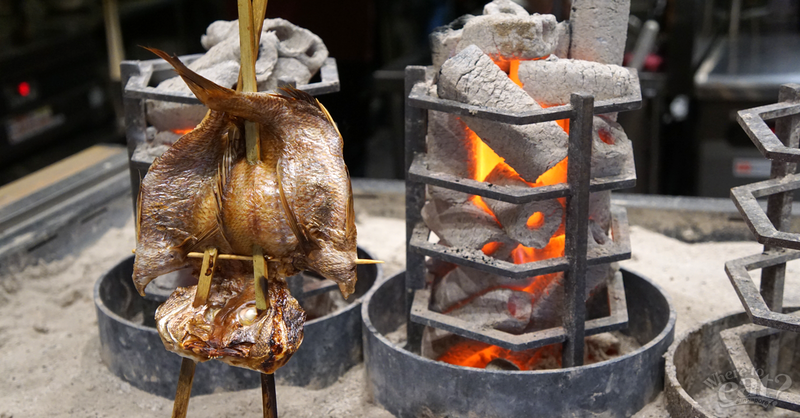 Before grilling, the fish is first marinated then dried in a fish-drying machine for 2 to 3 hours in the dry heat of 30 degree Celsius. With this marination and drying process, it can sharpen the flavors of the fish and give a twist to the regular taste. 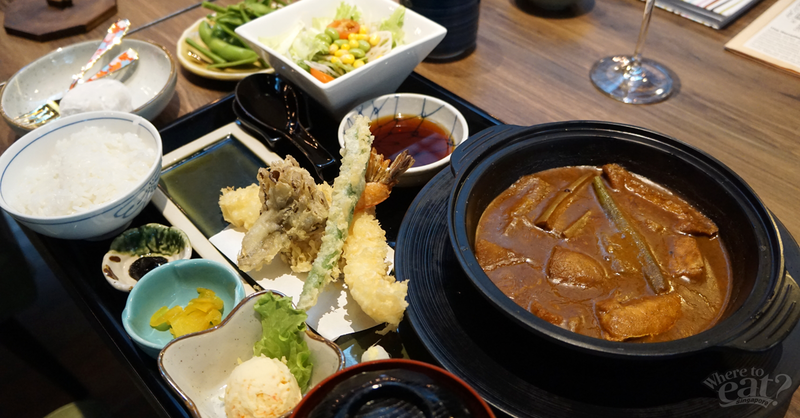 If you think Buri Kama (Yellowtail Cheek) Curry & Tempura Set is just like any other Japanese curry, then you might be wrong. Amazingly, the chef replicated Singapore’s famous fish head curry, and it matches the rest of the set pretty well. Completed with meaty yellowtail cheek, a vigorous yet comforting spicy gravy and a serving of tempuras, this is the set for those who loves heavy flavors. 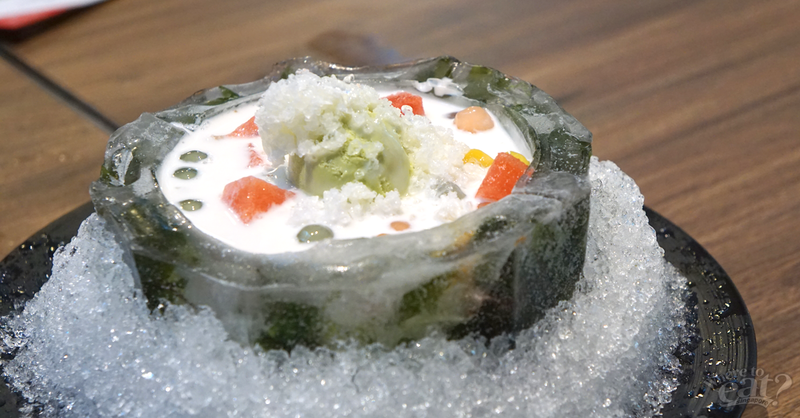 For a limited period, the restaurant now serves Sumiya Tropical Dessert – an interesting combination of mango, watermelon, rock melon, green tea ice-cream and red bean paste swimming in a pool of coconut milk sauce bordered by a hand-carved ice bowl. As there are only 15 servings per day, pre-order is highly recommended if you’re interested in giving this a try. Sumiya’s lunch sets are also available on weekends as well, but if you’re too busy to sit down for a proper meal, you can choose from their Takeaway Lunch Bento Sets menu which are just as good.